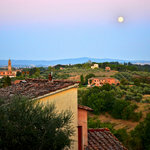 Siena is an anomaly, even in the eyes of Italians. When you walk through the city, you see hundreds of colorful flags displaying all sorts of bizarre animals on them. Normally, you will see one type of flag on one street and a completely different one on another. Unless you were told what they mean, one can easily not give them a second thought. 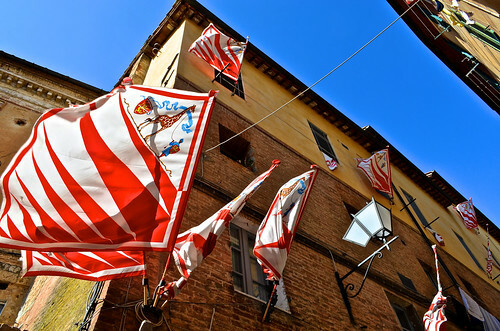 However, those flags represent the most important cultural aspect of the city of Siena, the Contrade (that’s the feminine plural form of the word “contrada”). Siena is divided into 17 different sections and each sections is a contrada. Each contrada has its own mascot that is either an animal or object in nature. For example a Giraffe represents the Imperiale Contrada della Giraffa. An owl represents the Priora Contrada della Civetta (pronounced “chee-veh-tah”). Other mascots include: an elephant, goose, tortoise, eagle, porcupine, panther, seashell, and a unicorn (yes, a unicorn). Interestingly enough, most of the contrade do not know why they use the animal they do. For example, my host father is in the Imperiale Contrada della Giraffa and their flag is a Giraffe being led by a Moor. I asked him why both were on the flag and he responded “non lo so,” I don’t know. Now for a short history lesson. Originally, the contrade were military units that helped defend Siena against the evil and imperialist Florentines (I know, I’m biased). In the present, the contrade compete in the Palio that takes place on July 2 and August 16 each year. However, only 10 contrade compete in the race. Although the Palio only takes place twice a year, the Palio is on the minds of the Sienese all year round. 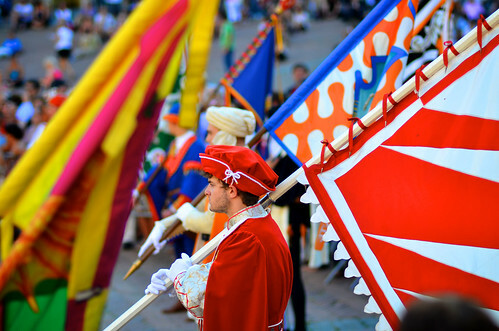 For example, each contrada elect a “capitano” whose sole purpose for the entire year is to win the Palio. He is essentially given a blank check to pay-off other contrade, make alliances, and plot how to make the enemy contrada lose. Every contrada has allies and enemies, by the way. Another interesting aspect of the Palio is that winning it is only the second best thing a contrada can do. 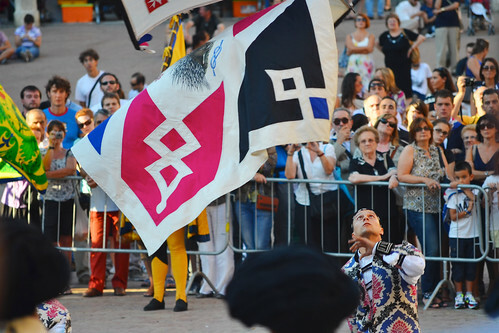 A contrada’s primary focus is to ensure that its enemy contrada loses (although, if a contrada wins the Palio, that would in fact mean the other contrada loses). A contrada will do almost anything to ensure that its enemy loses. That may or may not include purposely beating up the jockey of the enemy contrada before the race. As stated before, the contrade of Siena are the most important cultural aspect of Siena. The reason behind this is because they make up the Sienese social circles. 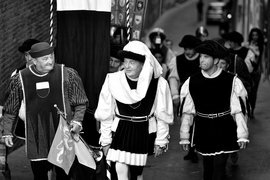 Essentially, a contrada is like one large fraternity. Your best friends are from the same contrada and usually, you’re spouse is from the same contrada. 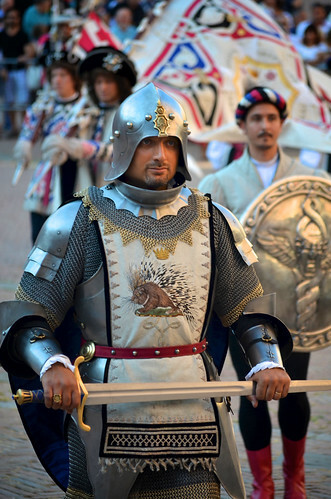 In fact, if you are married to someone that is in another contrada (my host parents, for example), you have to separate for the four days leading up to the Palio in July and August. No questions asked. When a baby is born, not only are they baptized into their respective religion, but he or she is baptized again in the fountain of their contrada and given the contrada flag in which he or she will have for life. Thus, you grow up with one large group of friends. Also, since most Italians stay in the city they were born in, you have that same group of friends from cradle to grave. The Contrade of Siena are a perfect example of hyper-regionalism in Europe (I think I foresee a future history lesson in the making). If you ask an Italian where they are from, they will respond with the following: city, region, and then country. If you ask a Sienese where they are from, they will respond with the following: contrada, city, region, country. The different contrade also like to hold huge discotecas in the middle of the street in front of the contrada church. Those parties are rather fun. The last one we attended had a Pirates of the Caribbean theme. The pictures I included are from the Contrada Flag Bearer costume contest. Okay, I’m sure the Sienese have a much cooler name for it, but that’s essentially what it was. They give out an award for the best dressed flag bearer each year. The guy in white appeared to be the only non-aligned person during the ceremony. The flag bearers of each contrada eagerly await the results of the competition. 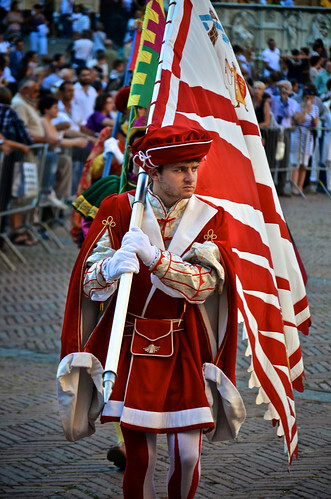 A close-up example of the typical attire of official contrada ceremonies like this one. Trick flag-throwing is a revered sport in Siena. The "guardians" of the official contrada flag-bearer dawn a full suit of armour for the job. The flag-bearer of the Giraffa Contrada is upset that he didn't win the costume contest. A close-up view of the Aquila (Eagle) Contrada's flag. 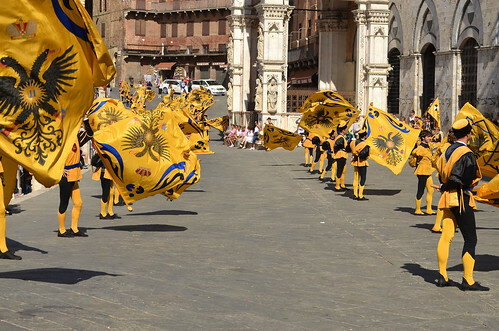 All of the flag-throwers of the Aquila Contrada line the periphery of the Piazza del Campo. 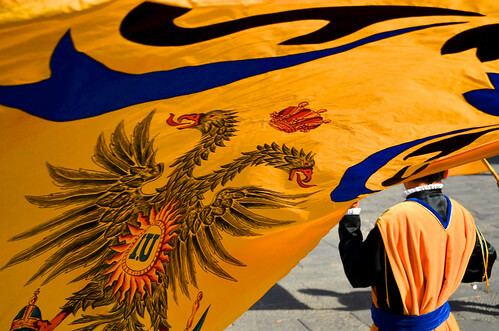 Members of the Imperiale Contrada della Giraffa proudly display their flags outside of their homes.